3 Dec: It is so easy to walk down Boulevard St Germain and miss this beautiful ceramic works on the wall of the block adjacent to the east end of Saint-Germain-des-Prés. 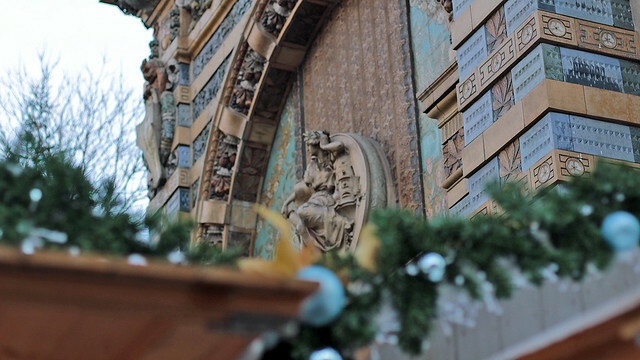 Situated within the square of Félix Desruelles, this Art Nouveau portico was initially part of a ceramic palace of the Universal Exhibition 1900 (thus contemporary of the Grand Palais and the Petit Palais) to showcase products fabricated by the famous Manufacture de Sèvres. I’d imagine it would have been very impressive to visit such a pavilion and admire the fine porcelain pieces that they were producing. 4 Dec: Aaaaaand they called it’s puppy looooooooooove… This piece of earworm was stucked for the entire day after I saw this piece of street art near La Rhumerie, even though I was not entirely sure if this was what the artist intended in the first place. 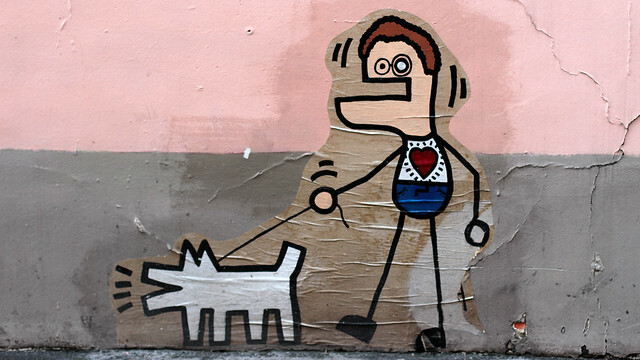 A quick online sleuthing later revealed this to be the work of Toctoc, as a tribute to Keith Haring, out for a walk with his dog. Got to thank Google Images in cracking the mystery of who the artist is, since the name had been removed from this particular piece that I photographed. 5 Dec: Sometimes, all I need to do to see something ephemereal but sublime is to look up and out of our living room window. This evening’s sky had been punctuated with shades of pink and violet, but it was the crescent moon and a distant star that stole the show. I wondered though if the star (have you spot it, near the end of the cloud streak in the bottom left quadrant?) was actually a nearby planet, like Venus? 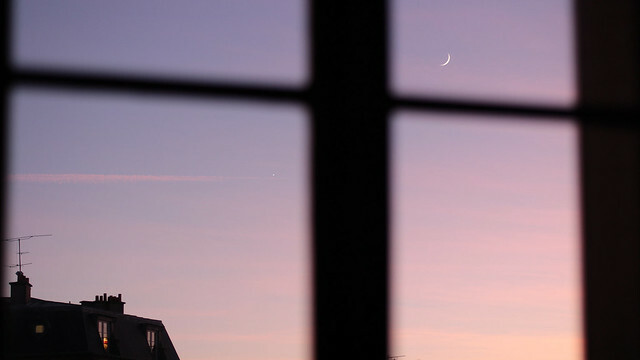 Afterall, I had – albeit accidentally – photographed something similar a few years back, of a crescent moon, Venus, and Mars, all visible in the evening sky. 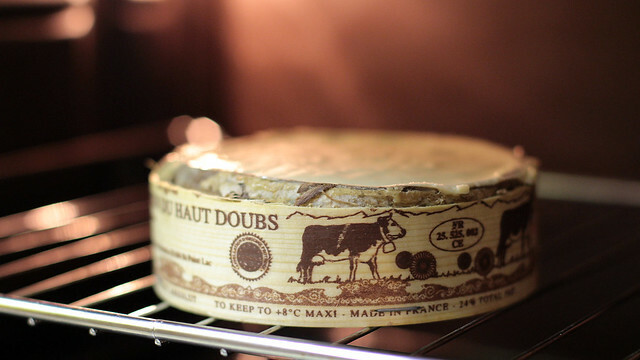 6 Dec: It had been sunny but also rather cold, so melted cheese came right into mind as the perfect winter dish. It is all rather straightforward – bake a small wheel of Mont d’Or in the oven, boil some potatoes, prepare a platter of cold cuts, and garnish with some salad. That’s all needed for the meal. Scoop the melted goodness onto the accompaniment on the plate, and savour every bite. In a way, it’s a simplified fondue without dipping into the pot. 7 Dec: Another day, another walk. Then I spotted the sign for underground path near Madeleine, so pedestrians may have a choice of crossing the road by this path, or wait by the traffic lights for the green man. It does, of course, lead to the metro station too. 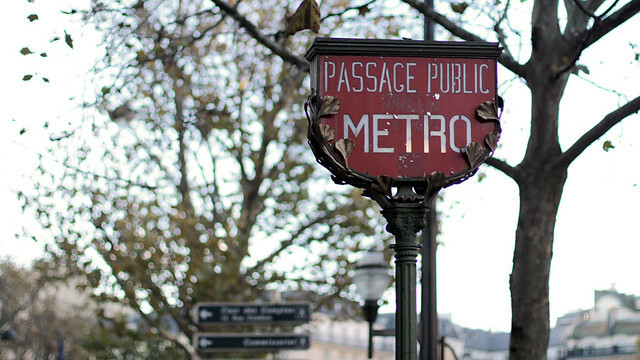 It is so ever elegantly made, matching the Art Nouveau style of original signs and panels to indicate the presence of metro stations. Such a shame there aren’t too many of them around the city. 8 Dec: Les Schtroumpfs. That’s what they call the Smurfs in French. I laughed the first time I heard of it. Schtroumpfs! It sounded so, heavy, giant-like, thumping-thump-thump down the road. 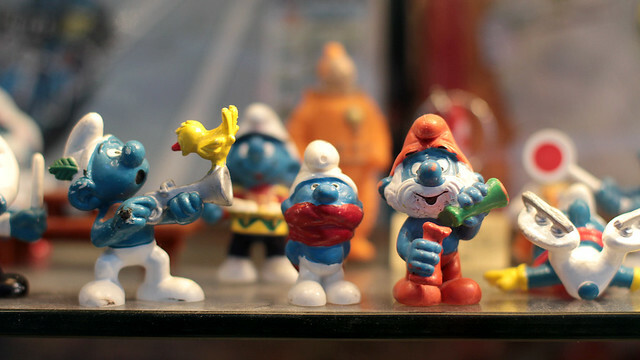 Meanwhile, the Smurfs are adorable little things, wee enough to live within mushrooms. It has been decades since I last saw any of the animations, even if there have been recent movie releases. Anyone seen those? Are they any good? It’s slow though, and sometimes frustrating when I felt I didn’t progress as much as I should. 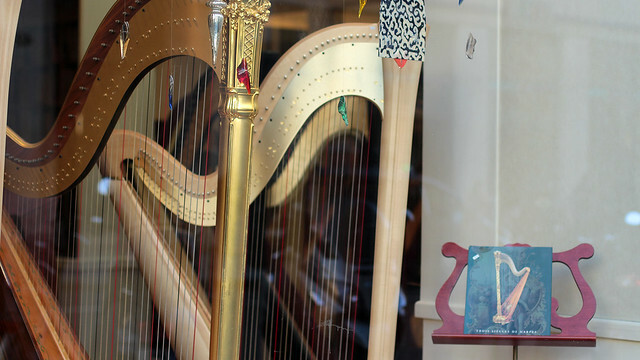 Not all harps are big. There are certain types that are smaller and easier to travel with.